Just imported from HKM Germany! 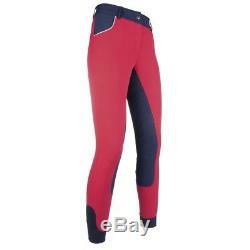 Hickstead Zoe Silicone Full Seat Riding Breeches. These are from the Pro Team Line and are very stylish and sporty. Red and Blue with white piping. Waist band - higher in the back - 3 inches. Small zipper pocket below back waist band. Breathable - dirt resistant - fast moisture absorption - soft and comfortable - machine washable in cold water - suitable for dryer - but I would line dry - 62% polyester, 32% viscose, 6% lycra - bi-elastic - comfortable elastic ankle- sock bottom - waistband with belt keepers - 2 front pockets. The item "HKM Hickstead Women's Silcone Full Seat Breeches" is in sale since Wednesday, September 26, 2018. This item is in the category "Sporting Goods\Outdoor Sports\Equestrian\Clothing & Accessories\Women's Clothing\Jodhpurs & Breeches". The seller is "whelantraum" and is located in Ruffs Dale, Pennsylvania.